This is no longer funny..
Thread: This is no longer funny..
After I found out my left side Sugino crank arm was the wrong square taper, I also received my ebay Stronglight crank. After cleaning it up, I installed it on my Peugeot and went for a ride; but no, there is again something wrong. The pedal is wiggling like a bent crank arm But you know what? The crank doesn't really look that bad; but the pedal is definately off. You take a look. Does it look like crash damage? Or is it a factory defect. Can I fix this? I gots to know. is that as far as it threaded in? old french cranks don't use a 9/16 spindle. (it's something metric and smaller.) my hunch; the previous owner "tapped" them with a pedal and did about as good a job as can be expected. you could ask your lbs if they could help you clean it up with a pedal tap but looking at how crooked your pedal is, it's probably f'ed. I don't think that's it..
On the back of the crank arm is stamped "9/16 x 20 deg." 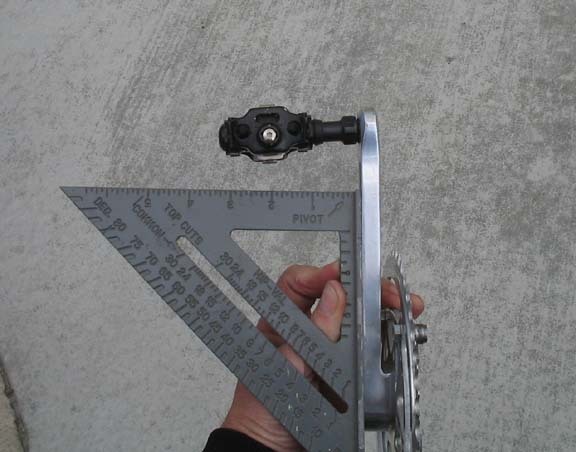 My LBS has the tools to drill and insert a helicoil; I just don't feel comfortable doing it. aw come on, you got the speed square where's your framing hammer? a couple of whacks and that thing will be good as new ! Go for it Brad. They are stronger than the original thread in some cases. Absolutely safe and trouble free. I've used them on motorcycles and car applications over the years with zero problems. "Welcome to my underground lair...."
How about contacting the ebay seller with this photographic evidence and asking what's up? I know you want the crank and all, but why settle for a possibly defective crank?